Could this picture be of Viola Mary Joy? Looking for your feedback on who is in this photograph. 23rd Sunday was a beautiful day. Perfectly calm, and lovely sunshine. It seemed so funny, having no church. At 10.30 Mr. T read prayers. At least first we sang one of those beautiful old metrical psalms to such a jolly old tune “The Lord’s my Shepherd, I’ll not want. Then Mr.Thom read a Psalm from the Bible, & then he made a little Preach about it. So beautifully simple & reverent, but in the broadest and most colloquial Scotch. It was so interesting. 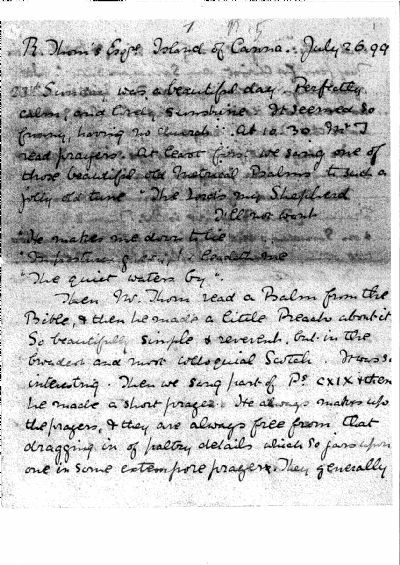 Then we sang part of P’s CXIX & then he made a short prayer & they are always free from that dragging in of paltry details which so jars upon one in some extempore prayers. They generally end with “Forgive us our sins, & keep us in thy fear for Christ, our Saviours Sake” He often prays. “Teach us to do Thy Will in airth as we hope to do in Heaven”. We have the Lord’s Prayer. He plays the flute while we sing. In the evening we had prayers again. The Steward of the Barmore comes to prayers (The Barmore is Mr.Thom’s yacht) & on Sunday’s the engineer & the stoker come to the other servants are all Roman Catholics. In the afternoon Minnie & I walked to a point called the Rou from which Rum looks the most beautiful, and so do the little bays on each side & the tidal island of Sanday. 25th Tuesday. Raining and blowing. Minnie and I went out, and soon came back because she doesn’t like getting wet before lunch. After lunch Louie & I were out in the small boat with deep sea lines & fished from the buoy & Louie caught one wee codling for the gulls supper. Then he said how wonderful it was that Prince Charlie should have been among these very poor people with such a price on his head for so long, yet not one of them ever dreamt of selling him. “The Irish would not have done that” meaning they would have sold him. Afterwards Mrs Allan played some plaintive little Gaelic songs on the piano- & then he played the pipes- wild skirling tunes- “The Lament of Mackenzie”, “The Portree Man” &c. It is wonderfully stirring. Then he played a funny little instrument called a chanter “The deil is i the kitchen” and Mr A said “I hope he is ‘n’ t.
Altogether we spent a most pleasant evening Allan stood on the hill and played the pipes quite a long time after we left, and I listened to them in the garden. They are even more delightful from a distance. He is supposed to play awfully well. 27th Thursday. Showery all day. However, we started off after lunch in the “Barmore” & went to Rum. Rum belongs to a very rich & fast young man, by name George Bullough who is hardly ever there, but he is building a large and very pretentious fine red sandstone house with dozens of rooms, and a long carriage drive, & he has quite a large stud and heeps of hot houses & vineries & 14 turtles who have a hot sea bath pumped up for them every day, & a lot of banana trees. Two of the vines had large clear tablets on which was inscribed the name of the vine “ Planted by Ian Bullough Esqr” “Planted by Miss Gladys Bullough” & the date. We had a lovely late tea on the yacht & then got in about 8.30 having enjoyed ourselves immensely in spite of rain. 28th Friday. Very wet day but had a jolly row. 29th Saturday. Wet again. We always go out though and then change. Miss Grant arrived. Her real name is “Grant of Grant”. She is the niece (?) of the Earl of Seaforth. For hundreds of years there was a tradition in the family that the last of the race in the direct line would be a deaf mute who would have two daughters, one of whom would raise a regiment of soldiers. The last Earl was deaf and dumb. He raised the Seaforth Highlanders. His two sons died and two daughters survived him. They lived together and were devoted to one another. At last one day the elder (?) one was driving her sister in a dogcart, when the horse took fright or something, the sister was thrown out. The wheel went over her head causing instant death. Well, on Saturday evening we had the grand concert. Between 40 and 50 people came. The men are so good looking and they all have such beautiful manners. When you give them a glass of whisky, they always stand up and say something in Gaelic which means “Good health to you” so prettily. They like my song very much. We persuaded one of them a fisherman, to sing a Gaelic song. It was splendid. They go on and on, verse after verse seemingly without taking breath at all. The chorus cuts in quite unexpectedly. We all sang it, some without words some with, a jolly swinging one. The islanders all swing themselves backwards and forwards with a curious rhythmic movement, especially the chief singer. We all waved our handkerchiefs, each two people holding one end, up and own. I did enjoy that song. It was so wild an breezy and very musical in a way, and it is such a weird language. All the Gaelic songs end very abruptly. This one was all about Glengarry. 30th Sunday. Was a lovely calm day, heavy with damp and mist. We had prayers at 10.30 as usual. The Allan Thoms came to prayers and stayed to early dinner. Mr. Allan told me how he fainted in (?) Parkers City Temple, a curious and horrid experience. He says that being so much in the open air, he can’t stand crowded stuffy places a bit. Went for a walk with Mabel in the afternoon & sat on the rocks and had a long talk. There were most lovely effects of light and shade on the cliffs, a sort of luminous golden veil thrown over the farthest off cliffs, and below a shinning silver strip of sea and then a foreground of dark almost black rocks and brilliant golden brown seaweed. Awfully nice little preach from Mr. Thom at evening prayers on St. Thomas. It’s not perhaps so much what he says, as the way he says it that strikes me so much. You feel that there is such a depth of true reverence in him & then his metaphors are so quaint and simple & he has so much common sense. He always comes back at once to the practical side of religion. “Let us not be thinking too much of what religion we are but look at our own everyday life”. After supper I had an awfully nice talk with Mabel about the English Church and Holy Communion and our favourite chapters from Isaiah. Altogether it was a very happy day. 31st Monday. There was thick mist in the early morning, so the Barmore had not got up steam which takes four hours to do and we could not start till past 12. We had the most glorious “sail”. On the way, we sighted a big buoy which had broken from its moorings, and then been drifted down the Canna Sound, between Rum and Sanday. We put off a boat with three men in it to capture it. It was quite exiting Mr Thom put the yacht in as near the rocks as he could while the men tied a rope to the ring of the buoy, and with great difficulty towed it up. It was very heavy, as it had a long chain in it. We towed it back in to Canna harbour and started again for Loch Nevis, which is in Invernesshire. The Coolins in Skye look so wonderful, their peaks a glorious blue, coming out clear cut against the sky, above an exquisite belt of cloud, below which their feet more dimly seen, seem to rise straight from the clear outline of deep indigo blue sea. Loch Nevis means Loch Heaven. The next loch, which we meant to go up too, but had no time is Loch Hourn, which means Hell. I have never seen anything so wonderful as Loch Nevis. The colour was indescribably beautiful. First, it is very wide, with great steep hills running sheer down to the blue water, here & there sweet little green glens, with charming crofter’s huts nestling in them. Then the loch gets narrower though still wide, and it looks as if it had come quite to an end, with a charming little harbour on the right, whence a funny, winding road leads across a dip in the hills inland to Loch Moidart, but to the left you suddenly perceive that the loch runs right up in a narrow passage between very high hills, one of which peeped out over the other, a deep dark purple, covered by soft white cloud. The other hills were all a lovely golden green. Looking back the way we had come, the loch seemed quite land locked, because you see Rum and Eigg beyond and they appear to cross each other. The whole forms a sort of amphitheatre of green and blue hills. I wish you could have seen it. The sky was wonderful too. Some of the clouds looked just like snow, and there were great streaks of white windy ones and lots of little cloud sheep which turned to a soft pink at sunset. Dear Canna looks so sweet as we came back, a rich green with glorious sky beyond. It looked so peaceful and cosy and open. Beautiful as Loch Nevis is I would rather live here, I think. One would feel so shut in at Loch Nevis. The Thoms knew the former owners of all that part, but now a rich Englishman has bought it, who has turned away all the crofters and made the whole place a deer park. The English are unpopular up here because they always do that. They can’t understand the love the people have for the place they were born and bred. It’s enough to make one wish oneself Scotch!!! 1st August Tuesday.Dr Sewell left..........A horn is blown when the steamer is about to start, & when a cow mooed Dr. S. Was sure it was the horn and made them all come down in the pouring wet all for nothing. I had a long talk with Mr. Thoms who found me reading Gladstones Life. I was grateful to that wretched man for once, as he procured me so much interesting information. At 7.30 last night we went out to fish at the North End. We caught 78! With four rods. It was lovely. The cliffs are 200ft high but look higher. I have never seen such myriads of sea birds. The air seemed alive with them puffins, kittywakes & cormorants. We saw hundreds of wee kittywakes in their nests- they were so sweet. The cormorants (scarts they are called here) always seemed to arrange themselves in imposing and picturesque groups, generally on the highest rocks and often at each corner. The puffins sit in unimposing clusters. They all live in separate colonies, never two kinds together. Father says basaltic rocks are never so fine in shape as other kinds which is true I suppose, but they are very fascinating. Wonderful holes and arches & pillars, one like a great narrow door. Another a curious arch. We asked MacArthur its name. He was very shy about telling us, but said very beautifully; “We ca’ it The Trowsers”! 2nd August Wednesday. It was a dull damp morning. I went up to play with the wee Allans & stayed to lunch. In the afternoon Mabel, Louie and I went out in the boat and paddled. 3rd August Thursday. Left at 10am in the Barmore. Went right round the island and the men hauled the “long line” & got some big skate & dog fish. Some of the cliffs on the north and west of Canna are really most beautiful. Very precipitous & full of curious holes and niches. But what chiefly strikes one about it is the greenness as compared to all other islands round. Then we went across to Skye, and up Loch Brittle, which means “the wild loch”. It is very wild. On the right are the westernmost peaks of the Coolins some of them 3,000ft & on the left very broken green hills. The Coolins are very rugged and sharp in outline, & the grey loch golden in sunlight & deep blue in shadow looks quite bare of vegetation above a certain point. We then went out on Loch Scavaig (loch of small rocks) further East. It is in the heart of the Coolins. One hill runs right down very steeply into the water. One of its Gaelic names is said to mean “Come let us run down it” The colours were indescribably beautiful and the jagged broken shapes too. Loch Coruisk is a few miles inland behind a great rampart of rock, but we had no time to land; but we went on to Eigg. It made me think of “Poor Jack” to hear Mac Issac taking the soundings. There is a curious rock which looks like a pillar from some points, called the “Scaur of Eigg”. With lovely rolling hills covered with heather, Eigg is very pretty, but too tame. The heather was glorious. Louie and Minnie went to call on the minister. Just fancy on that little island there Established, Free Church and Roman Catholics & no end of squabbles. The Free Kirk man & the R, C’s against the established. I waited outside and went exploring down a steep hill covered with heather and braken through which I waded almost knee deep & crossed a swift burn; & we all went back to the harbour and by a short cut across a freshly hoed turnip field! The sea was a clear light blue, as smooth as glass & the sun blazing. Eigg reminded me of Jersey only it (Eigg) is much more hilly. We went home round the far side of Rum. The cliffs were splendid. We had one of those golden pathway sunsets. 4th August Friday. Another glorious day. We took our lunch out on Compass Hill, so called because all the ships compasses are deflected in passing it. After dinner fished. 5th August Saturday. We went and played with the “wee boy” and carried him pig a back across the west sands to Sanday to the big hayfield there to take his father’s lunch. I never saw such a pretty sight as the little fair-haired child in his white frock running about in the hay being “herded” by Rover, the big sheep dog. On my way back, talked to an old man who had put into the harbour with his little schooner laden with lime and slate. He told me he never sailed on Sunday if he could help it. He also said that he thought it didn’t much matter what church you belonged to if you tried to do right. 6th August Sunday. After very nice Prayers, Louie and I......took the wee boy down to the bay where we bathe-a sweet little round one with a beach of fine white sand and high rock cliffs at each corner, so to speak (I don’t mean corner I mean these points) and played in the sand till dinnertime. In the afternoon walked up to the Highest Point a good long climb over heather & grass-covered rock terraces rising one behind the another. At last when we got to the top there was a glorious view. You could see that you really were on an island. The beautiful sea all round. We sat a long time on a big rock and talked. Louie said she thought it a pity that they did not observe Festivals more in the Scotch Church & seasons too e.g. Lent and Holy Week. They often have no service on Good Friday. 7th August Monday. We all went to Hyskeir. It was a perfect day. Mr Thom said he had never seen the Atlantic so calm for such a long time together, about 10 days straight on end as clam as a milkpond. Hyskeir is the only land between us (Canna) and America. It is simply a rock with wonderful basalt pillars just like the Giants Causeway, I believe. It is 1 and half miles long and rather less a half mile broad and has patches of rich long grass and many with stagnant pools, half salt half fresh, and a curious gully running right across which the seas comes right through at high tide. In spring there are thousands of sea birds & in autumn hundreds of young seal, both the ordinary kind & the grampus which has long woolly hair. When we were there all the young birds had flown except two young fluffy black-backed ones. Mr Anderson put his wife’s cloak down over one and it seemed not to mind a bit indeed rather to like it. He never observed it till we came back to fetch the cloak & then found it sitting underneath! It allowed us all to stroke it & didn’t seem at all frightened by the 10 strange animals kneeling around it. The other one was sitting out in the open & seemed more frightened but did not move a muscle. We also saw some young wild ducks- such pretty green and brown things-but they were terrified at us & hid under the reeds at once. There is a good deal of driftwood. Mr Thom said. “There’s a nice piece of firewood” I picked it up and carried it on my shoulder to the boat, & in spite of all their jeers & laughter said I should take it back to London & burn it on Xmas day. Louie showed me a hollow rock, that is to say that when you stamped on it, it sounded quite hollow. I managed to find it again after I had gone right away from it & showed it to Mabel which I thought rather wonderful myself! Canna looks so wonderful from Hyskier. You see the 3 islands one behind the other from where the yacht was anchored just off the N.E. side of Hyskeir. Hyskeir quite low & brown & yellow, Canna higher, and blue and green, Rum higher still and blue and purple and cloudy. A nice strip of silver sea between Hyskeir and Canna. We lunched on board. It is such fun all squeezing into that little deck-house & you are always so hungry. There are seats round three sides & the other people sat on coup stools. We went home at slow speed because it was such a lovely day. Mr Thom said People would think we were a “lame duck” which thought quite distressed him. 8th August Tuesday. 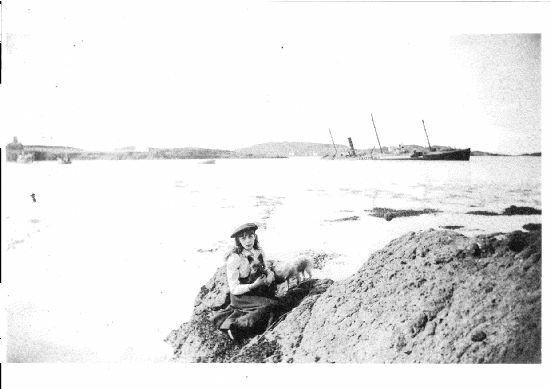 Mabel and I went with Mr Thom in the gig to fetch some skylights cast up from the wreck “Labrador”. It was so jolly being rowed by 3 men. We went all round the beautiful North end & landed in a difficult place on the rocks. At least the men kind did. Mabel and I sat in the boat. It was wonderful to see Mr Thom, who is 70, climbing about the slippery rocks in big sea boats. The “Labrador” was wrecked on the Skerryvore rocks about a year ago. She mistook Skerryvore for the coast of Ireland. All her crew were saved, but the ship and cargo quite lost. Numbers of casks of butter & barrels of apples came ashore on Canna and Hyskeir. Mr MacIssac said “she was a great blessing to Canna” These skylights from the engine room were about the last relics of her and the thick plate glass was quite unbroken. Of course each circular piece was not much more than 6in in diameter. Had a delicious bathe, grubbing in the sands in my bathing dress. Afterwards went fishing round the North End 7.30 to 11pm. 9th August Wednesday. Some of us went in the boat and landed on Sanday & Mabel took me to see the wife of the skipper of the Barrmore. She is such a sweet woman; she is supposed to be the nicest woman on the island. They are not nearly as nice as the men taken as a whole. Allan says most of the men are spoilt by their wives. The woman are so awfully lazy & sit with their hands folded nearly all day. There is only one old woman left who does any spinning & very few of them knit, but worse than that, they are apt to neglect their children & husbands. But this Mrs Donald MacKinnon was quite sweet. She looked down so modestly & prettily when you spoke to her but into your eyes when she spoke to you. She was rather my idea of a Madonna. 10th August Thursday. We were to be called at 4am & the steamer was not expected till 5am at the earliest, though on Tuesday it came at 4.45 & the poor Andersons kept her waiting 15 minutes in spite of running all the way to the pier and having no breakfast. Well the boat came in at the very same time when I wanted to go, & we had a jolly good scramble & I was not allowed to say goodbye to Louie who was in bed, nor do more than drink a cup of very hot tea, by way of breakfast. After all the wretched boat waited about 20 minutes after we got on board. Mabel and Minnie came to see us off. It is curious how sad I felt leaving Canna. The spell of the island had begun to work upon me, or perhaps, I should say the spell of the Highlands. I nearly cried outright. At last we were off & I stood in the stern and watched a deer little green island till it was quite hidden away behind the hills of Rum. It was a perfect morning, calm and fresh & beautiful. At Tobermory-a sleepy little semi-circular “town” in Mull-the Captain said we should have at least 15 minutes to wait, so we went ashore & took a nice shady walk along a lovely bank of trees through which you get glimpses of the sea. It reminded me somehow of the Banks at Durham. Miss Grant was awfully afraid at being left behind by the boat so she would hurry back. There were no signs of starting so we wandered about the streets & then went on board and read, after asking the man at the gangway how long it would be before the boat started, & being told 15 minutes- we waited an hour. We got to Oban at about 2pm & I was met at Gareloch head by the Thoms coachman & said goodbye to Miss Grant. © Miss Joan Burchardt; kindly re-produced with her permission as copyright holder of this extract. Viola Mary Joy was born in 1879. 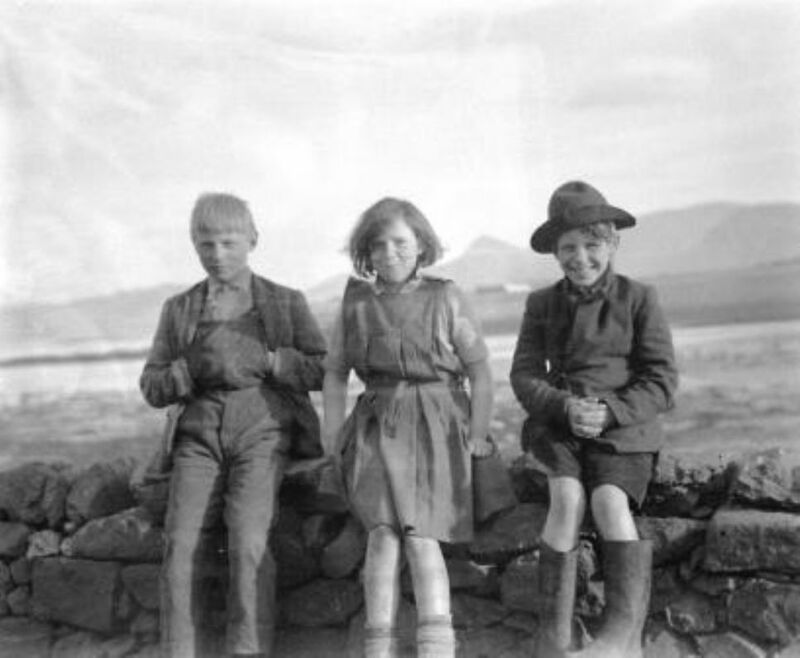 She spoke often of her trip to Canna and the trips she made from there during her lifetime. She was very enthusiastic about them and enjoyed reminiscing. She sang at the ceilidh. She did not attend school very much but had a broad education and loved visiting galleries and numerous artists’ studios with her father, the artist George W Joy. Viola used to visit Mr. Thom (the preacher) and his family and was gently chastised for being so forward as to ask if she could visit Canna at some point with them. Mr Thom was a Unitarian and well known in those circles more so in Liverpool. Viola Mary Joy was to marry in 1907 and had seven children. We owe a great debt of gratitude to one of Viola Mary Joy’s children Miss Joan Burchardt who donated this diary to the Canna Collection just before the death of Margaret Fay Shaw Campbell in 2004. Miss Burchardt was delighted that the diary was to go into the Canna archives and we acknowledge her as the source of this fine archive and as copyright holder.